Backup catcher Wil Nieves hit his first career grand slam, a drive off former San Diego star Jake Peavy, and the Padres beat the San Francisco Giants 6-4 Sunday to take three of four against the defending World Series champions. It was the first career slam and just the 10th homer overall for the 37-year-old Nieves,who was a 47th-round draft pick of the Padres in 1995. He signed as a minor league free agent in January and won the backup job after Tim Federowicz, obtained from the Dodgers in the Matt Kemp deal, was sidelined following knee surgery. Making his first start of the season, Nieves homered to left on a 1-1 pitch with two outs in the fourth. Peavy (0-1), whose first start of the season was delayed because of a back injury, loaded the bases on a single by Kemp, a walk to Justin Upton and a one-out single by Will Middlebrooks. Peavy, the unanimous 2007 NL Cy Young Award winner while with the Padres, allowed four runs and four hits in four innings, struck out five and walked three. San Diego's Tyson Ross (1-0) allowed three runs and five hits in six innings, struck out eight and walked four. Craig Kimbrel pitched the ninth for his second save in as many chances. 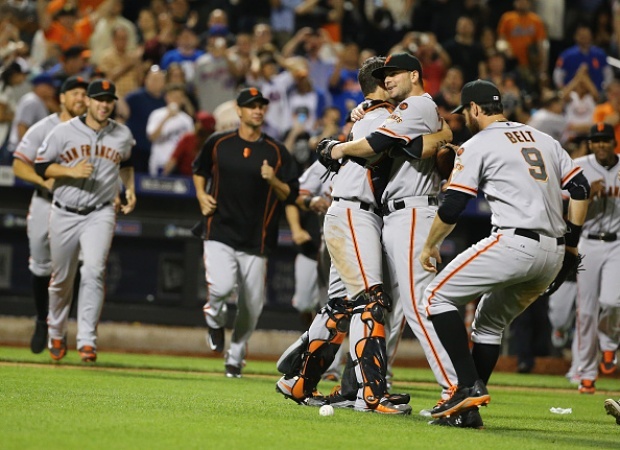 The Giants had given Peavy a 2-0 lead on Matt Duffy's RBI single in the second and Brandon Belt's RBI hit in the third. Belt had missed four games with a strained right groin. 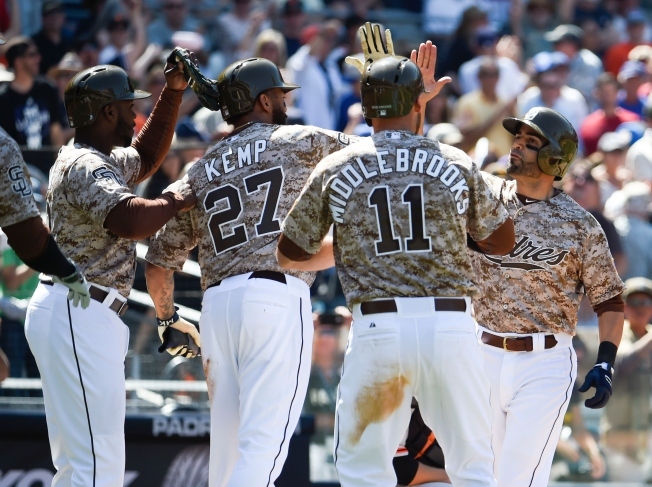 Gregor Blanco's RBI triple down the right-field line in the sixth pulled the Giants to 4-3 before Alexi Amarista's RBI triple into the left-field corner in the bottom of the inning gave the Padres a two-run lead. Buster Posey homered off Dale Thayer with two outs in the seventh, his second, to pull the Giants to 5-4. Giants: 3B Casey McGehee said an MRI showed he has a bone bruise in his left knee. He had a cortisone shot and is expected to be out a few days. "All things considered I feel real fortunate. It's as good of news as I could hope for,'' McGehee said. He said he suffered the injury Monday against Arizona and aggravated it during an at-bat in the first inning Saturday. Padres: Andrew Cashner (0-1, 9.00) is scheduled to start Monday night when the Padres open a three-game series against Arizona, which counters with Rubby De La Rosa (1-0, 10.13).